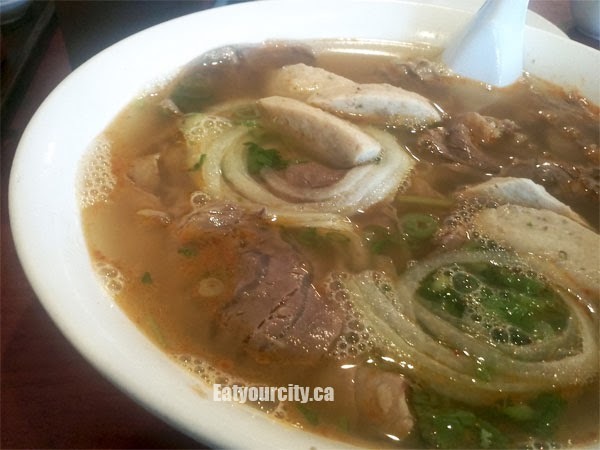 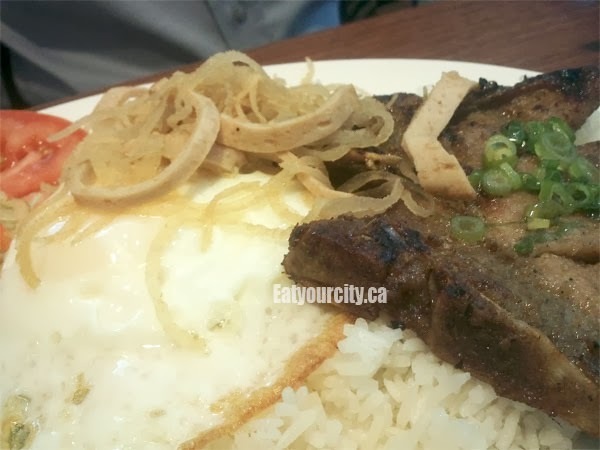 Eat Your City: Pho Hoan Pasteur, Edmonton, AB - Great consistent Vietnamese noodle soups, Bun Boh Hue and rice vermicelli bowls! Pho Hoan Pasteur, Edmonton, AB - Great consistent Vietnamese noodle soups, Bun Boh Hue and rice vermicelli bowls! 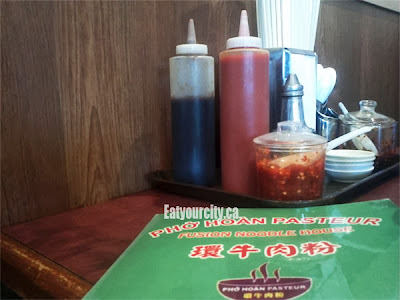 Like any good pho place, there's extra utensils, napkins (for the inevitable noodle soup splashes), homemade satay sauce and chili sauce for those that like to add a bit more heat. 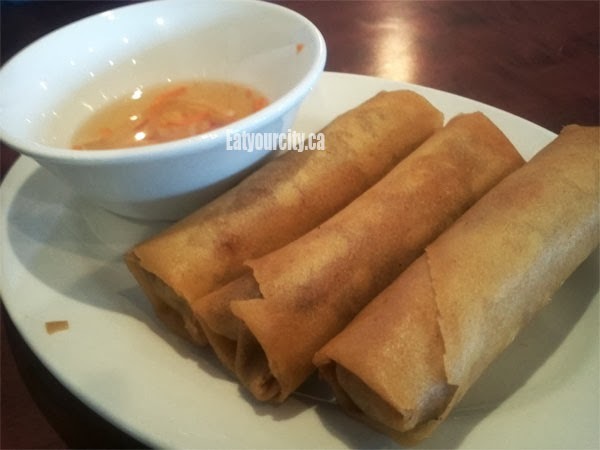 We start off with spring rolls, nicely crispy hot on the outside and filled nicely with a mixture of pork and vegetables on the inside. 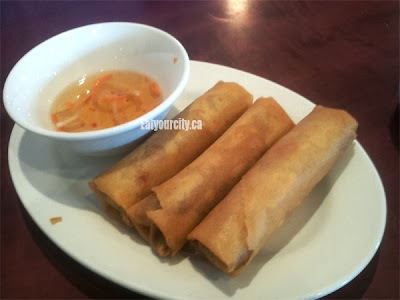 The fish sauce based dipping sauce could use a bit more acidity, but that's just my personal preference. 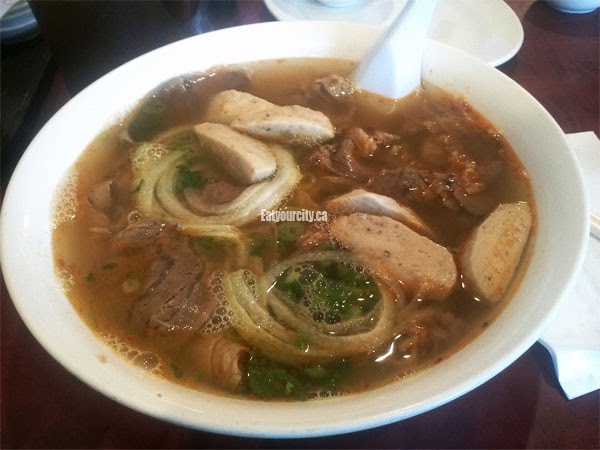 Pho is a star anise flavored beef broth with lots of beef meatballs, sliced beef flank, sometimes sliced fatty beef sides, crisp tender tripe (you can ask for it without), soft beef tendon pieces (hey, eat that, its full of collagen and great for your skin! 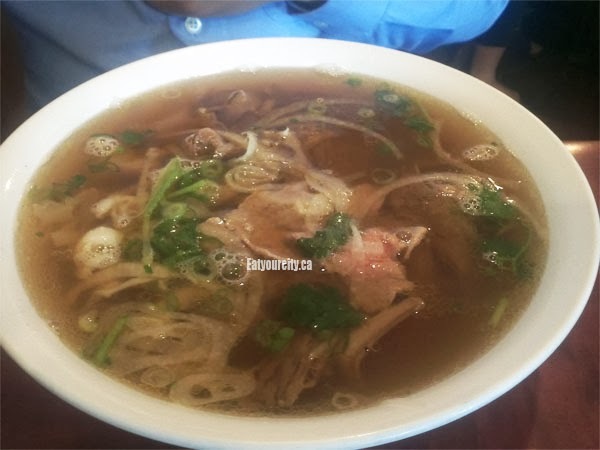 ), topped with diced green onions, slivered sweet onion, and cilantro. Its served with crunchy crisp bean sprouts, extra chili peppers, fresh basil, lime wedges for you to add in to customize. 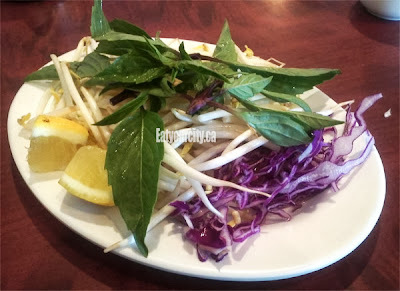 Shredded red cabbage and occasionally shredded banana flowers (not on the day I took pic) as well as bean sprouts are the optional veggies you add to this aromatic spicy broth with lots of meatballs, thinly shaved steak and other lovely delicious ingredients. If you like it more flavorful and spicy, ask that they scoop some more of the chili oil when you order. 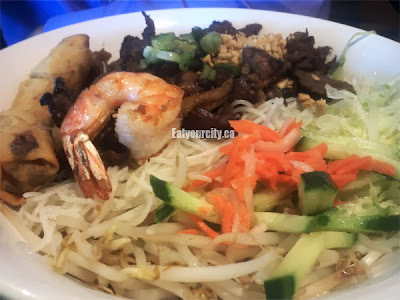 The rice vermicelli bowls look deceivingly small, but are fully loaded and pretty filling. 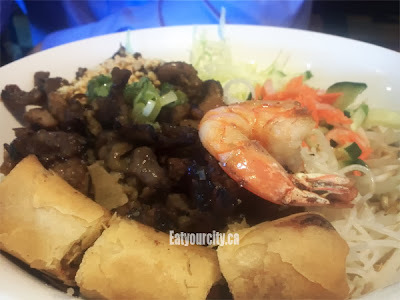 This is a version that I think has everything you can think of tossed on top: charcoal grilled shrimp, crispy spring rolls, grilled seasoned pork, grilled lemon grass chicken and grilled beef. Dump on a bowl (or 2) of the seasoned fish sauce and dig in! 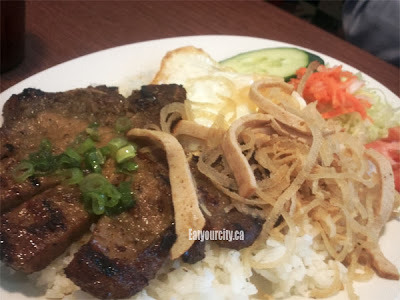 The rice dishes are pretty simple, but inexpensive and filling. 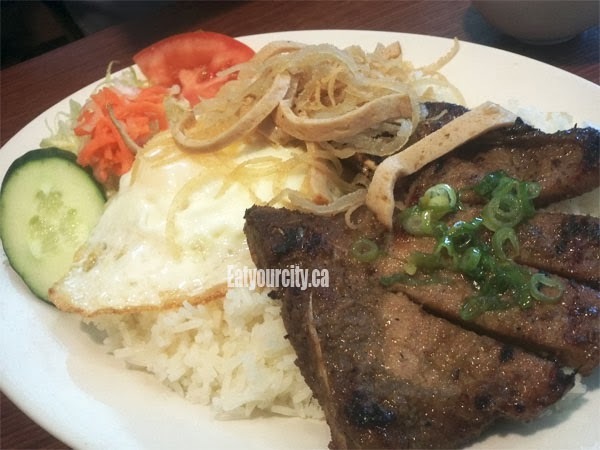 Mistakened this one for a broken rice dish, but its regular rice, with a huge flattened grilled pork chop, eggs done anyway you like, a salad and chopped Vietnamese sausage. Anyway you spin it, Pho Hoan Pasteur is the place to go for consistently tasty Vietnamese food, and traditional noodle soups you don't get to try everyday. 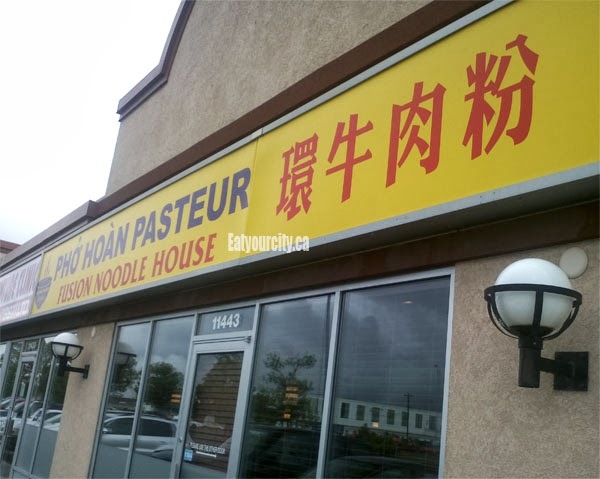 Nom!